Aero Shake allows the user quickly minimize all opened windows except the current active window by shaking its title bar. Shaking the title bar again will restore all the minimized windows. Disabling Aero Shake could be helpful to prevent mistakenly minimizing other opened windows while moving a window. Download the following REG files: Disable Aero Shake For Current User. Extract the ZIP archive you've downloaded to any location, e.g. put them on your desktop. If prompted, click Yes in UAC, Yes in Registry Editor, and approve the merge. The procedure described above will disable Aero Shake in Windows 10 for the current user only. The undo tweak is included to the ZIP archive. It is called Enable_Aero_Shake_for_current_user.reg. 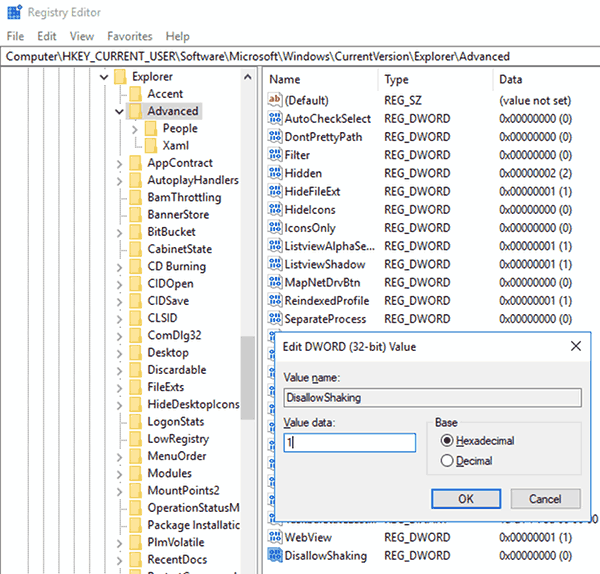 The registry files modify the DWORD (32-bit) value 'DisallowShaking' under the registry branch HKEY_CURRENT_USER\Software\Microsoft\Windows\CurrentVersion\Explorer\Advanced. The value data of 1 enables Aero Shake, DisallowShaking = 0 disables it. Also, you can disable Aero Shake in Windows 10 for all users. Download the following REG files: Disable Aero Shake For All Users. When 'NoWindowMinimizingShortcuts' is set to 1, the Aero Shake feature will be disabled for all users of your computer. When it is set 0, Aero Shake is enabled. The undo tweak is included to the ZIP archive. This tweak works in Windows 10, Windows 8.1, Windows 8 and Windows 7. Windows 10 comes with the two features are called "Aero Snap" and "Aero Shake" which allow to arrange windows and manage their position and size. Here is how to disable Aero Shake.